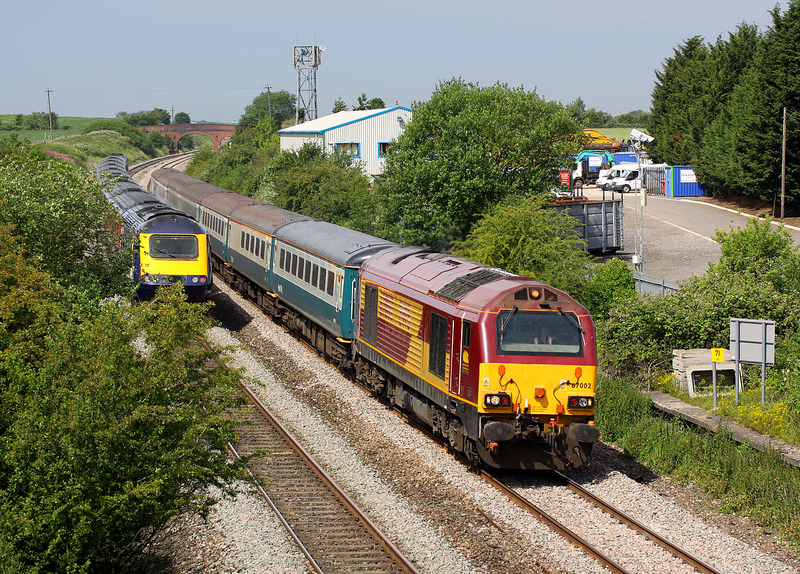 67002 Special Delivery very nearly gets blocked out by a HST at Shrivenham on 27 June 2011. Running 15 minutes early, it speeds past the site of the old station with the Raileasy 1Z27 10:00 Frome to Preston 'Mudex', returning happy festival goers back from the Glastonbury Festival, where they have seen such big name acts as U2, BB King, Don McLean, Morrissey, Paul Simon, and of course the undoubted highlight of the event, the Wombles! Unfortunately the 1C09 10:00 Paddington to Paignton 'Torbay Express' comes within a second of ruining the shot. One the plus side however, if the 67 had been on time it would have passed by in the cloud, as a weather front coming in from the west blotted out the sun just a few minutes after this picture was taken.